Local farmers soon will see new technology specifically designed for agriculture, thanks to two separate entities. The Virginia Cooperative Extension was granted $104,000 from the Tobacco Commission for a “SOVA Agribusiness Information Technology Program.” The program hopes to increase productivity on farms by incorporating information technology. The Institute for Advanced Learning and Research in Danville is working with technology for agriculture, but its focus is more research-based. The SOVA Agribusiness IT program is a cost-share program that would reimburse 33 percent of up to $1,200 per producer for things like laptops, financial software such as Quickbooks, agriculture-based software like Farm Logic and Cattle Pro, and professional website development. Applicants will be required to attend at least one educational session. The program, called a pilot initiative in a news release, hopes to work with approximately 80 farms from the tobacco region, including Pittsylvania County. Dr. Scott Lowman at the Institute is working on three different projects right now — the AgBot, time-lapsing plant growth with smart tables and entophytes. The smart tables were developed in partnership with the mechanical engineering department at Virginia Tech and could also be used to cut metal and wood into different shapes. Lowman is using them for a different purpose. Showing off some of his time lapse video Friday, Lowman could show that over two days, a specific plant struggled to wind itself around a branch, so it changed direction so that it could reach where it wanted to climb. 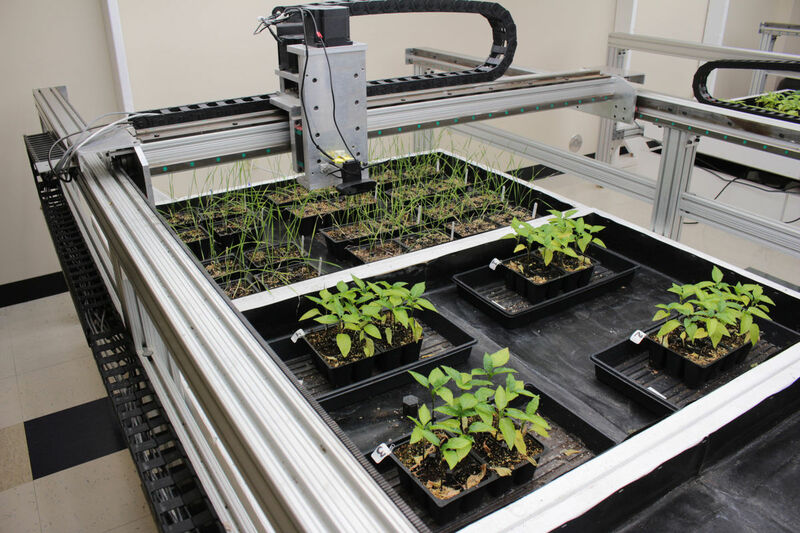 The AgBot hasn’t been put into use yet, due to a delayed tobacco planting season, but the Institute received a grant to work with 20 regional farms over the next two years in order to see the AgBot in action. The AgBot was revealed in August at the Institute. It is a quadcopter drone with a full spectrum camera powerful enough to tell if there’s disease on a single leaf on a plant, and a thermal camera that is powerful enough to tell if someone in a room full of people is running a fever, according to Lowman. Entophytes are bacteria inside plants that promote plant health and growth. The Institute has compiled a library of 500 different entophytes, some of which can be licensed out to other companies. Lowman compared the entophytes to eating a cup of yogurt or taking a probiotic, but for the plants. It is not genetic engineering — it’s just taking the good bacteria in a plant and adding to it. These entophytes could lead to a revenue stream for the institute, if they are chosen for commercialization by other companies like Indigo Agriculture.